Wonderful news. Let’s have some auto-da-fes, please. Ugly churches have been a pet peeve of mine for a long time. Remember the poured-concrete monstrosity that looks like an ottoman mating with an armchair? More here. And look, it’s the Mosque of Ming the Merciless. Hey OWS, what about work & discipline? Hmph. When he’s as worried about ugly behavior by the clergy as he is by externalities like buildings and music, I’ll say hooray for him. The parish church I abandoned was built McMansion style. That’s not why I left, but it didn’t hold me to stay. The MIT chapel by Eero Saarinen, from the outside a windowless brick cylinder surrounded by a shallow stagnant moat, ought to be an architectural atrocity, an abandoned factory chimney to hold religious service in. Inside it is a serene, hushed fortress. There is no suspended dove and yet the skylight and the screen behind the altar are the best representation of the Holy Spirit I have seen, with a pagan hint of Zeus as a rain of gold. The water in the moat reflects light rippling up the walls from below, animating them, as if the space were a clear pool in a forest glade. The unlamented Roger Mahony left the faithful with a hideous brickpile with $18 parking. 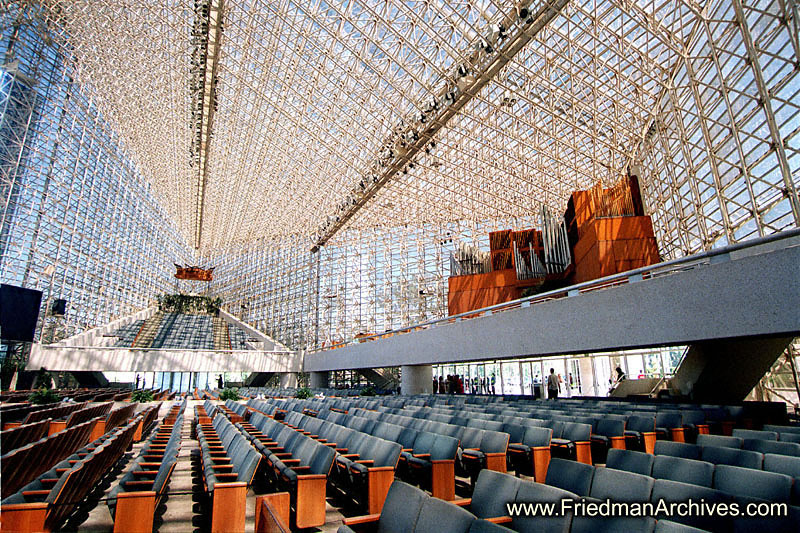 The Orange County diocese just bought the Crystal Cathedral from the church founded by the drive-in church. It’s all glass, so I imagine the liturgical art will be scanty. Somehow I prefer the derivative, ostentatious 19th-century churches that imitate European models, even if not constructed in the same way. OTOH, look at St Andrew’s in Riverside, to be consecrated on 12/3. Both of the cathedrals in Oakland and Los Angeles were featured in the link to the post from your Beliefnet blog, but they’re so bad, the the one in Oakland being particularly atrocious, that I thought I’d supply another link I found about them recently, one with more photos. The only saving grace (pun not intended) about the one in L.A., which I’ve been to a couple times, is the tapestry on either side of the church, depicting many saints. Other than that, it’s fairly cold and sterile. What’s your take on Barcelona’s Sagrada Familia? So Rod, should the church on your linked site, L’Eglise Ste-Bernadette du Banlay, be called “St. Augustine of Hippo”, or just “Hippo”? The Ming the Merciless Mosque reminds me of a mosque I lived near in Constantinople. It bore a striking resemblance to Darth Vader’s helmet. All designed by “name brand” church architect I.M Pray, no doubt. Can we spread this to modern architecture generally, please? Clearly, it’s not just churches the modernists have ruined. Yes, it’s derivative, based on a Greek model. But compared to the Mahony chapel, it’s brilliant. Here’s a view of the inside of the drive-in MTD church in Garden Grove, which the Romans are buying. I can’t blame the Archbishop too much–it cost him $57 mil, and a new cathedral (which might be far worse and less distinctive) would cost $200 mil. Still,no room for icons, statuary, or side-chapels. So what do you think about the new cathedral in Barcelona? Been there, love it. Did you know Gaudi was an extremely devout Catholic? Gaudi’s style is so singular that it’s hard to hold him up as an example of anything. He’s as far away from architectural traditionalism as he is from architectural modernism. I do think that the Sagrada Familia doorway done after Gaudi’s death is a terrible blemish on the cathedral, though. I wonder if this will affect the Orange County Diocese’s recent purchase of the famous “Crystal Cathedral,” which is supposed to become THEIR cathedral in a few years? As someone who is non-religious, my interactions with churches are from the outside, so how they look is particularly important to me. I’m a big fan of the classic New England white church with a clock tower that is topped with a steeple. Do a Google image search for “classic new england church” to see some good examples. A town center without one of these buildings somehow seems incomplete to me. However, my style preference is likely culturally contingent and if I grew up elsewhere I would probably like something else. Non-descript boxes don’t bother me, but they aren’t pleasing either. Ugly modern churches are particularly annoying, but fortunately there are few around here. When we moved to pittsburgh in the mid 2000s, this Church was right down the street from us. It struck me as odd that it looked so much like Ponce De Leone’s hat. Equally odd, to me at least, was that so many of Pittsburgh’s churches were in the style of mid-1960s. I was very much expecting old-school immigrant churches. They had those, sure. But ones like the one listed above seemed really commmon. Ummm, I’m not Christian, but it seems odd to me to object to worshipping in a “garage-style church” Someone who was allegedly born in a stable. The church I attended for the first 18 years of my life was styled after some kind of tent. As in, imagine a brown circus tent made of brick and concrete that held about 800 people. From a very early age I recall not understanding why the old churches were so beautiful and the new ones so dreadful. One Catholic church that I particularly dislike is the National Shrine of the Immaculate Conception, in Washington, DC, I dislike it not because it’s stupefyingly ugly, but because somehow it’s less than the sum of its parts. Many of the individual chapels inside are beautiful, but somehow they don’t add up to a coherent whole. The effect is esthetically jarring somehow. It really seems like it was designed by a committee — a committee of individuals who each had a great idea, but who never talked to one another and tried to harmonize them. So a conservative church in a conservative diocese chooses to celebrate its rituals in a cutting-edge building designed by an openly gay architectural genius. I suppose, on the other hand, that it’s some sort of progress that the previous owners found themselves forced to sell mainly due to a theological battle between the older, founding generation and the newer, more “fundamentalist” second generation. Llovera should read up on the history of the basilica. Before that, the classical Greek temple itself had its origin in the Mycenaean megaron, a room apparently used for various official purposes. I have sometimes snarkily remarked to students that if this trend continues — repurposing secular architectural styles for religious purposes — perhaps the religious building of the future will be modeled after the shopping mall: each religion will have its own individual space within the overall structure. Sometime after the Second Vatican Council, I noticed a change in the side alter with it’s statue of St. Joseph. There appeared two golden shapes best described as amoebas plastered into the wall. Since this spot at the communion rail was where I prayed penance every Saturday I had many chances to decipher just what these devotional shapes might be. I noticed that one of the amoebas had a hard edge which differed from it’s mate. Finally one Saturday it struck me! This was a modern art expression of chalice and bread loaf, the body and blood of Our Lord. Sums up the post council church pretty well in my opinion. The first was this idea that you had to “declutter” churches. I don’t remember the exact Vatican II phrasing, but it had something to do with getting rid of excess, of side chapels, of a lot of art, etc. Not only that, clutter sometimes helps people get into a “liminal state,” that mental spot between waking and sleeping, where the conscious mind sits this one out, where the adaptive unconscious can work, and the psychological unconscious as well. Similarly, the auditory version of Vatican II reform closed side chapels and forbade side chapel masses to go on at the same time as the main Mass. So the white noise hum of many Masses, all said in Latin (no distraction from English words), all out of sync with each other, all chanted or spoken in chant-like tones, overlaid with the choir of the main Mass – all this probably worked together to form a wall of low, barely perceptible sound which also would add to liminality. What they forgot is the crucial point – bad theology does not make bad religion. Bad *ritual* makes bad religion. Then, when bad ritual rules the day, everybody gets obsessed with theology because there’s nothing else left. The church where my grandparents grew up got rid of their communion rail some years ago. Apparently my great-uncle, who, like my grandparents, had gone to the parish school, saw part of the communion rail sitting in the parking lot, and started crying — because he remembered when he, along with other students in the parish school, had donated their pennies to help pay for the communion rail. What the wreckovators and desecrators never seem to understand is that these things *don’t belong to them*. If anything, they are just the temporary curators. Apparently this is one reason why Frank Lloyd Wright’s “Usonian” houses never worked out as cheap housing for the masses. Wright insisted on designing “complete environments”, down to the color of the carpet and all the furniture and furnishing. Unfortunately, ordinary people have an annoying tendency to want to personalize their living space, and to use their grandfather’s chair, and their mother’s lamp, and family photos, and so on. From what I’ve read, this rather human tendency of actual people to want to put personal touches in their own living space drove Wright up the wall. Or at least the food court thereof.